In2Connect with Sullins newest bi-level series of straight PCB, extender card or right-angle 0.050″ (1.27mm) and 0.078″ (1.98mm) edgecard connectors. These connectors uniquely provide double the contact points in half the linear connector length. With two rows of parallel pads on each side of the PCB and two sets of pick-up contacts within the body; these connectors uniquely provide double the contact points in half the linear connector length. Specifically engineered for heavy-duty applications, these new patented connectors are made of a high-density dielectric material to cover a -65ºC to +150ºC operating temperature range. They notably feature both primary and secondary engagement contact areas, with the secondary area recessed in the card slot. Moreover, their 0.078″ (1.98 mm) contact centerline spacing results in four rows at 0.156″ (3.96 mm) spacing, whilst the 0.050″ (1.27 mm) contact centerline spacing results in four rows at 0.100″ (2.54 mm) spacing. Connectors are RoHS compliant. 0.050″ contact centre spacing can replace 0.100″ to double the number of contacts within the same board area. Backwards compatible with the daughter card side. 0.078″ contact centre spacing can replace 0.156″ to double the number of contacts within the same board area. Backwards compatible with the daughter card side. 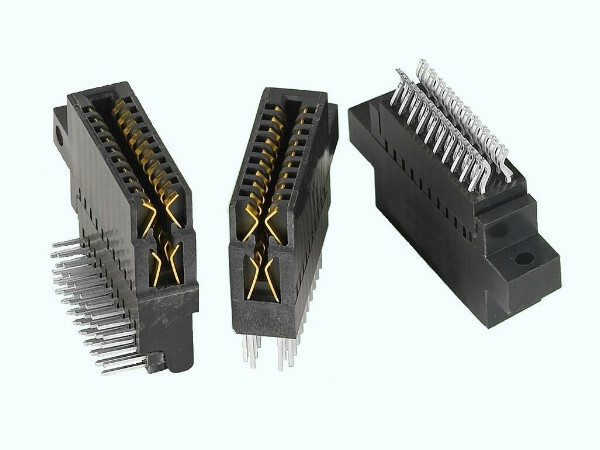 These connectors are all about saving board space and are ideal in a wide array of consumer, industrial, and commercial applications. They are most frequently used in electronic component testing, communication equipment, medical equipment instrumentation, power converters and power supplies, along with aerospace and automotive systems and products.